I am a little super in love with this stuff! But basically it is an amazing lip therapy gloss. The packaging is effective, elegant and durable. A little goes a SUPER long way! 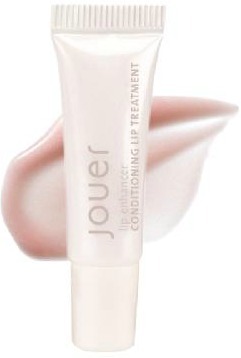 When you put it on the gloss effect will last for at least 3 hours (which is insane for a gloss). However what I love most about it is that it heals and hydrates well. Have you ever put on a lip balm and your lips tingle and feel like water has just been dumped on them but 20 minutes later they are dry again? I have! This product doesn't do that! One of the things I love using it for is when I do makeup on a client the first thing I do is look at their lips. If their lips are dry and cracked then lipstick will not look good on them. So if they are dry I put on the Jouer Lip Treatment and while I do their hair or the rest of their makeup I let it sit. (at least 30 minutes) and then wipe it off. The canvas is usually moisturized and ready to go! I have had TONS of great feedback from models and clients too! So yes I definitely recommend this!